Moon Cresta is a 1980 Arcade game developed by Nichibutsu. It is a single player (or two player, alternating) space shooter and was unique at the time for it’s multi-level concept. Instead of the usual format, in Moon Cresta you get a three part ship. For a 1980 arcade game, the variety and movements of the aliens are amazing. To start the game, you get the first part of your ship. If the aliens destroy part of your ship, then you get the next part. If you successfully destroy four alien waves, you must dock with the remaining portions of your ship. The quicker that you are able to dock , the more bonus points you will receive. When docked, your ship is larger and easier for the aliens to hit. Also, when firing, the cannons will alternate firing from different parts of your ship. Since the cannons are spaced differently, this has an impact on your aim. When all three parts of your ship have been destroyed, the game is over. At 60,000 points, you earn a bonus play. Click on this link to learn more about the arcade version of Moon Cresta. Moon Cresta has become one of my favorite games for the 7800. The 7800 version was written by Bob DeCrescenzo in 2011 and Bob provided a few carts to Atari retro gamers last fall. Just recently, Moon Cresta has become available for order at the AtariAge store. Bob’s 7800 version is true to the arcade and the graphics look great. Bob spent quite a bit of time getting the alien movements to work correctly and the result is fantastic. Moon Cresta is a hard game and it took me a long time to finally get to 10,000 points. I was hoping that some type of bonus would happen at 10,000 points, but the bonus occurs at 30,000 points in the 7800 version. So far, I have only managed to get to 30,000 points 3 or 4 times. I can’t image ever being able to play Bob’s Moon Cresta on the most difficult setting. Once again Marc (Freelancer Games) has done an outstanding job with the label and box graphics. Click here to learn more about the development of the 7800 version of Moon Cresta. 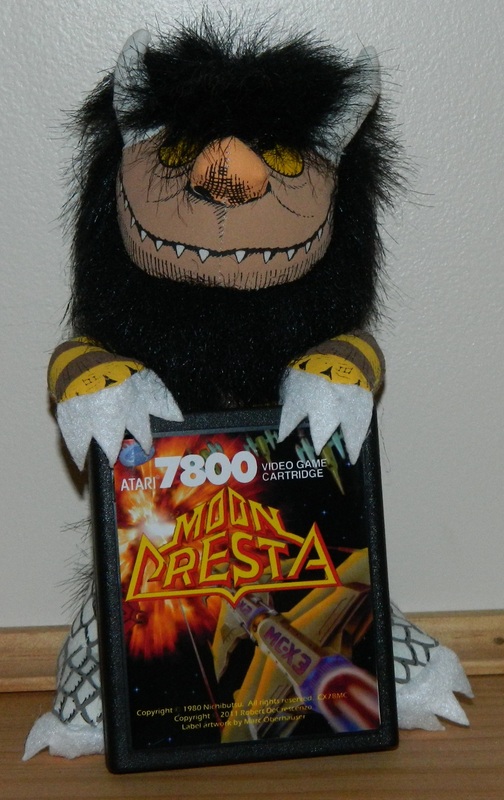 To buy a copy of Moon Cresta for your 7800, visit the AtariAge store. As I mentioned in a previous blog, in order to produce new homebrew games, existing carts need to be sacrificed. In some cases, new circuit boards for carts are available and only the shell needs to be recycled. In other cases, both the shell and board are reused. The most desired cart to reuse is the 7800 cart with out a dust cover. Later 2600 (mostly red label) carts also used this same shell. They are popular for homebrews as these shells can hold either 7800 or 2600 cart circuit boards. It is a lot of work to produce homebrew games and one of the major challenges is tracking down donor carts. There are a few of us that help out the community, by buying up old carts and providing them to game developers and the places like AtariAge. Ebay is one place that donor carts can be bought, but the prices tend to be high, except in large lots. 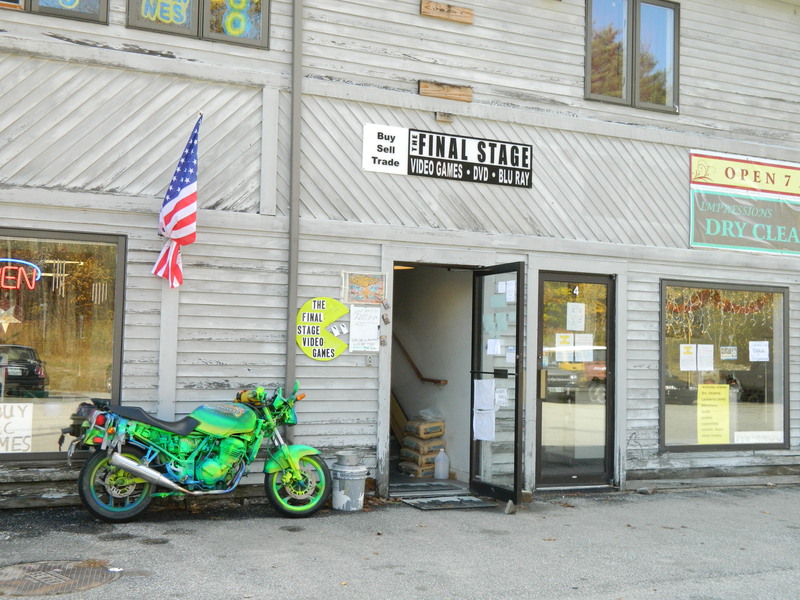 Other options include garage sales, swap meets, and retro game stores. One day cart shells and 7800 boards may be manufactured again, but for now they have to be recycled. A few must die so that others may live! Categories: 2600, 7800, Atari | Tags: 2600, 7800, Atari, retro | Permalink. The Space Invaders arcade game was developed by Tomohiro Nishikado and released by Taito in 1978. It was a smash hit and Taito sold more than 300,000 Space Invaders arcade games in the first two years. It was so popular in Japan, that it actually created a shortage of 100 yen coins. By today’s standards, it is a pretty simple game; 55 aliens move back and forth and come ever closer to your laser cannon. The aliens also attack with laser bombs and move faster as you destroy them. The original games were a single white color and colored cellophane was used on the display to make it appear that the game was multicolored. Back at Atari, Rick Maurer was developing a VCS (2600) version of Space Invaders. He got a prototype version of it working, but no one seemed interested. He, thus, moved on to the development of another game. In 1980, Atari was able to license Space Invaders and they had Rick complete his work on the 2600 version. It was a smash hit; the first Atari game to sell over a million copies and is credited with quadrupling sales of the 2600! The 2600 version of Space Invaders was pretty darn good; there were only 36 aliens, but it had variations that the arcade game did not. Rick added 112 variations such as 2 player modes, moving shields, zigzagging bombs, and invisible invaders. If you had a 2600, I am sure that you also had a copy of Space Invaders! In 1982, Atari released the 5200 ‘SuperSystem’ and Space Invaders was one of the launch titles for this system. 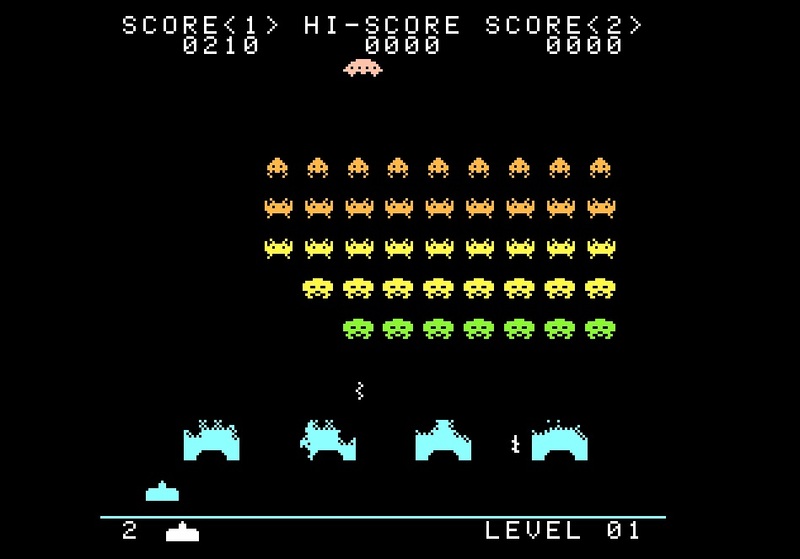 The 5200 version of Space Invaders has a total of 48 aliens that enter from the left and march across the screen, before starting their back and forth movement. The aliens are multi-colored and mutate their shapes in advanced rounds of the game. Atari included a total of 12 variations as well as 1 or 2 player options. The variations include 3 or 5 lives, slow or fast bombs, alternating slow and fast bombs, and bombs that home in on your laser cannon. The control in this game is pretty good with a standard 5200 joystick, but the 5200 track ball gives finer control of your movements. Atari included a nice touch by having the sound of the aliens increase as they get closer to the bottom of the screen. The 5200 version of Space Invaders is not really a port of the arcade version, but, rather, a new concept for the game. The concept isn’t bad, but it could have been better executed. The graphics are not really much better than on the 2600 version and this game does not really show what the 5200 is capable of. Space Invaders for the 5200 is still fun to play, but it could have been a whole lot better. In 1984, Atari released the 7800 ‘ProSystem’ and officially cancelled the 5200. 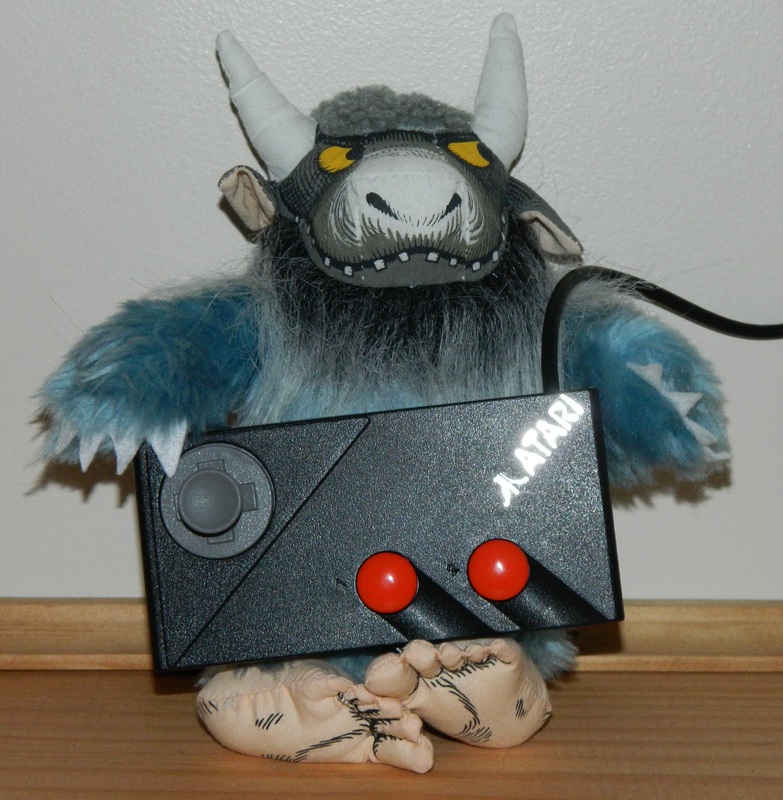 Atari developed 7800 specific ports of many arcade classics, but not Space Invaders. Fortunately, Bob DeCrescenzo has done an excellent port of Space Invaders for the 7800. Bob’s game is true to the arcade with all 55 aliens and adds similar options to Rick’s 2600 version such as such as 2 player modes, moving shields, zigzagging bombs, and invisible invaders. Bob also added color options to reflect the different cellophane overlays that were used on the arcade systems. Bob’s version is challenging, addictive, and a ‘must have’ for anyone who has a 7800! Space Invaders for the 7800 is available from AtariAge. 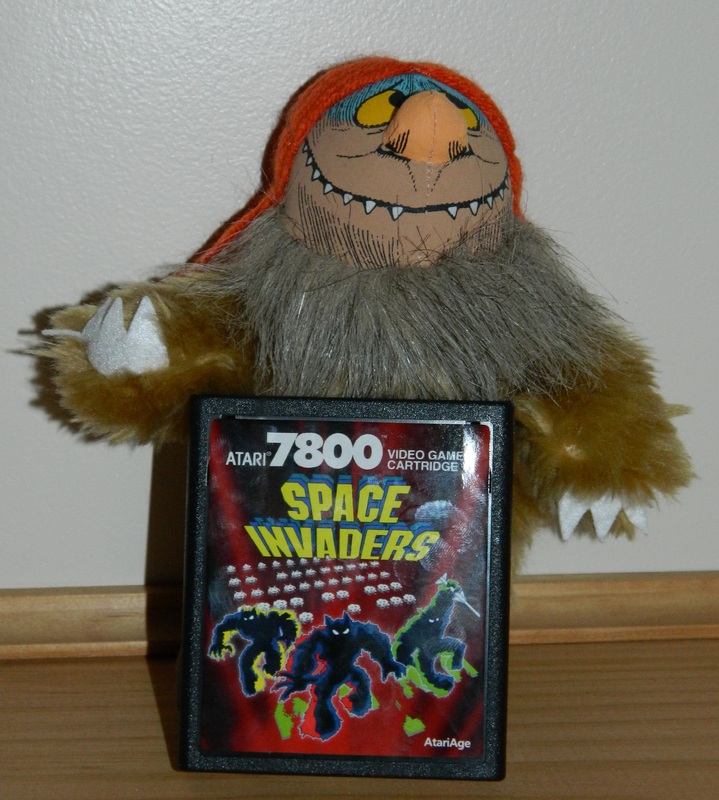 If you are lucky enough to have played Space Invaders on all three Atari systems, then I am sure that you will agree with me the Bob’s 7800 version is the clear winner. If you don’t have a copy Space Invaders for the 7800, rush over to AtariAge and order yourself a copy of this great game! Categories: 2600, 5200, 7800, Atari, Game Reviews | Tags: 2600, 5200, 7800, Atari, VCS | Permalink. The 7800 was originally planned to be released in 1984, but the great video game crash and Atari’s sale to Jack Tramiel, held up the release until 1986. Some games that were in development were shelved at that time and others when Atari stopped making the 7800 in early 1992. As it turns out, there were some great games, that were nearly complete, that were never released. Over the years, the code for some of these games has been located and a few of these games have been made playable and released by 7800 enthusiasts. Some of these games were able to be complied and released on carts to the 7800 community. Three outstanding games that have been made available are: Klax, Plutos, and Sirius. Klax was a 1989 Atari coin op game that was released for the 2600, the NES, and the Sega Genesis, but not for the 7800. Klax is a computer puzzle game along the lines of Tetris. Klax for the 7800 was, apparently, completed but never released. Almost a decade ago, Klax was rescued and can now be played on the 7800. I don’t have a copy of Klax for the 7800 yet, but it is on my wish list and it should be on yours as well. Plutos and Sirus were games in development by the British company Tynesoft. The source code for these games was found in 2008 by Curt Vendel and three talented programmers (Bob DeCrescenzo, Mitchell Orman, and Eckhard Stolberg) were able to compile stable versions. A couple of other enthusiasts have made carts available to the 7800 community. Theses games are very similar; Plutos is a vertical scrolling space ‘shoot um up’ and Sirius is a horizontal scroller. I was recently able to get my hands on carts of these games and they are amazing. The graphics in these games set the bar for what the 7800 is capable of and they are fun to play as well! Had they been released back in 1990, they probably would have been big sellers. Other games that have been found in various states of completion are: Gato, Pit Fighter, Missing in Action, Rampart, and Rescue on Fractalus. Games that were announced for the 7800, but are still missing are: Electrocop, Millipede, Sky Fox, and Steel Talons. One day, the source code for one or more of these missing games may be located and released to the 7800 community. For more info on the games in this blog check out Atari Protos. Categories: 7800, Atari | Tags: 7800, Atari | Permalink. A few months ago, when this adventure began, I had no idea what a homebrew game was. Although Atari stopped development of games for the 7800 and 2600 twenty years ago, some dedicated and creative folks have continued to develop games. In fact, in the past few years, more than fifteen new 7800 games have been released and several more are in development. Guys like Mark Ball, Ken Siders, and Robert (Bob) DeCrescenzo (aka PacManPlus) have developed games like Wasp, Beef Drop, and Pacman for the 7800. Bob alone has developed more than a dozen games for the 2600 and 7800! Others have developed label and box art for the games and many homebrew games are available with professional looking manuals and boxes. One key individual who develops the art and has boxes printed is Marc Oberhäuser (Freelancer Games) from Germany. Many of these games can be purchased at AtariAge, run by a fantastic guy by the name of Albert Yarusso. What’s even more amazing is that these guys don’t do this to make money, they just do it because they love the hobby. It is a lot of work to put together a cart for one of these games. First they have to buy up old carts, remove the labels, clean the cart, shell, and unsolder the existing eproms. They then have to program the new eprom, solder it in, reassemble the cart, and apply the labels. They also have to arrange for the manuals and boxes to be printed. All of this is time consuming work on top of the actual development of the game. And…if you think that these homebrew games might not be that great, think again! Most of them are really amazing and are better games than the ones that Atari released for the 7800. They also help to fill in gaps in the 7800 library. For example, the ‘Pac-man Collection’ (the cart is pictured in my blog header) by Bob DeCrescenzo offers Pac-man, Ms. Pac-man, and six other variations. Pac-man and Ms. Pac-man are nearly perfect translations of these arcade classics and show both Bob’s talent and the 7800’s capabilities as a home arcade system. If you have a 7800, or have now decided to get one because of this blog, be sure to plan to include some homebrews in your collection! Categories: 2600, 7800, Atari | Tags: 7800, Atari | Permalink. The 7800 was released in 1986…over 25 years ago! Atari released about fifty games for the 7800 and there were also several 3rd party releases. One of the things that has amazed me is that it is still possible to buy brand new games for the 7800. Atari sold about four million 7800 systems and they must have also made millions of games. Many of these can be had, inexpensively, still shrink wrapped, as they just came from the factory. In fact, I paid no more than $15 each for my first few games, but some were as inexpensive as $5. I was also able to pick up some used games on ebay. I have learned to buy games in lots of six or more; large lots often go for as little as $1-2 per cartridge. Of course, at that price, you are just getting cart without the box or manual. Games like Alien Brigade, Commando, Ikari Warriors, and Midnight Mutants were released toward the end of the 7800’s life cycle and were manufactured in smaller quantities. These command higher prices all the way up to $100 for a shrink wrapped copy. While collectors may want to have complete games with boxes and manuals, all you need to have fun is the cart itself. There are several sites where you can find the manuals for the games, so it is easy to build up a good collection of 7800 games without spending a lot of $$$. Also, don’t forget that the 7800 plays almost all of the 2600 games. Loose 2600 carts often sell for less than $1 and there were some great games made for the 2600! Games like Demon Attack, Missile Command, Pitfall, and Warlords play great on the 7800 and are as much fun now as they were 30 years ago! Categories: 2600, 7800, Atari | Tags: 2600, 7800, Atari | Permalink.